I had to get up at 6 am on a Saturday morning just to take this photo for you! No I did not... I'm kidding. In fact I took it much later, but it was still grayish/blueish and covered, so they left the street lamps on. There is not much to say about it: it's Paris, it's La Pyramide du Louvre and yes, it's beautiful (and for once empty!). Have agreat Sunday everyone, I still find it hard to recover from the Jet-lag on my end (but I know I mustn't complain!). Beautiful doesn't quite cover it. Really lovely, Eric. Just enlarged this photo and I have to say that once again your framing is perfect. Oh, wow, that's an interesting shot. Did you notice there is a ghost on this picture :O ? Lovely. The atmosphere is wonderful. your blog is making me so excited about the fact ill probably be moving to paris in october...and coming to visit even sooner! Thanks for the great photos! I see the "ghost" on the bottom left, Tomate!! As far as your decolage horarie, Eric,(I never said I can spell, in ANY language)YOU ARE A WEENIE!Just joking, if anyone can understand, it is me. You have my sympathy. On the otherhand, you sure can take a picture that lingers in our hearts. Wow! I really want to come visit! Beautiful shot! I can feel the chill in the air. Such a clean, attractive photo Eric. No ghosts for me, unfortunately (that would be fun!) but it's a ghostly picture all the same. Very dramatic and gorgeous and...I think I'll just stare at it for a while. Ah, the Louvre in blue-gray! Lovely! This picture takes my breath away. Yes, this one is a classic. Merci. Lovely in its absence of people and the low light level adds much. I see a 2011 calendar, month of January presumably! The composition, the lamplight, the absence of color—it's all gorgeous. Tomate & PHX: I see a ghost too, but I see it to the right of the first lamppost (in the upper-right corner)—looks kinda like Jerry Garcia. No, I'm not kidding about the ghost. We have a famous ghost in my family and I'm a believer. I just want a resting week-end too. No jet-lag for me though. Homeworks and daydreaming will be fine. Definitely a calendar shot, but better than that, reality. SO glad you captured this in the snow. This shot has such a dreamy, cinematic feel to it. "I still find it hard to recover from the Jet-lag on my end" I have experienced jet-lag before, but it was always an 'all-over' sensation. To get it on 'your end' must be really uncomfortable. What's that like Eric? Agreeing with everyone this is a great shot. Since it's really far from my house, thanks for take time to capture it. I don't see what you see, Alexa, but there is a man walking in front of the first small pyramid on the left, dressed all in white, with a hoodie on. He looks like a walking "ghost". wowwww it is so..... gray! and beautiful. Seems like the whole city is asleep, everything is quiet. It's mystic and so-so beautiful. Thank you, Eric, for all your shots - they're always stunning. Next year's calendar should have a photo per week... otherwise it will be a waste of fabulous pictures! We're in January and I already have several that I want to vote. 41 Comments so far!! Wow, it's another photo hit! Top of the charts as they say in the radio biz. I was walking down the street in San Francisco and I saw a car flattened out and what appeared to be huge staples stapling it to the side of the outdoor wall of an indoor parking garage. I walked further down the street and saw a monster statute reclining and its face was looking up at the sky. The statute (the length of the building) is on the roof of a building (I don't know how many stories high). I thought to myself if I did a San Francisco Daily Photo, I would definitely post those things. But, alas, I do not have Eric's photo eye so I doubt that I would do the subject matter justice. I am doing a painting of the Louvre now. I use my photos for points of reference when I paint. I also use my sketches and hand-written notes. I manipulate to get the desired results. I am never happy with my photos by themselves (just certain aspects) -- they are just visual notes to myself. I do not consider myself a photographer. I fell in love with your photo at first sight and thought, I am going to hang this photo on the wall. It's stunning, you've done it again. I see the ghost. I don't see Jerry Garcia though. wishing i was there! But it's 75 degrees here in Altadena today so I'll appreciate my blessings! Tres joli! Moody. Evocative. It is stunning, it makes me miss Paris so much!!! I've been following ParisDailyPhoto for a long time, and this is one of my all-time favorites. I just made it my desktop wallpaper. I was surprised (not really) to find my immediate response tonite to today's photo reflected in so many of the comments here: Yes! This photo expresses the epitome of Paris for the 2011 January calendar. It's very touching. (And thanks, Eric--your color calendar arrived January 02--I'm very happy. This photo is beyond stunning ... It's magical! Oh, how beautiful. I would have to agree with many others that this is a calendar shot for 2010. Just gorgeous! How beautiful. I wish I could be there in person. Beautiful! Thank you for remembering that many of us love these typical photos that so essentially capture Paris. Phenomenal shot! Both eerie and beautiful at the same time. 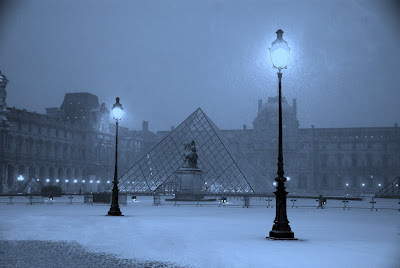 I'm really loving all the snowy Parisian photos the Paris photo bloggers are posting. Keep them coming! Wish I was there to see Her in her coat of white. She wears it well!!! Just love it, a magical touch has it. Oh wow, this is great!!!! I'm with Alexa about the calendar. It's a beautiful, beautiful shot. I hope we will see this one on next year's calendar. Very nice. How beautiful. My wish is that one day I will get to visit the Louvre. Peace.